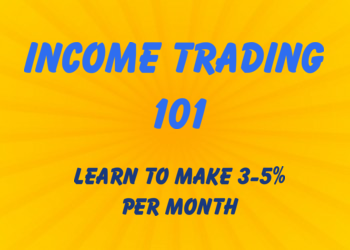 If you're looking for full time profits as a part time trader, you must adjust how you approach the market and how you execute on your trades. I'm going to show you a simple way to get better entries and exits on your option trades so you can earn better profits even when you aren't in front of a screen. If you are a reactive trader, then you'll spend all day chasing hot stock tips and getting bad fills. You'll feel like you're doing something in the markets, but when you look at your results it's disappointing. Your success as an options trader revolves around how you plan your trade executions before they happen. Yet it's a mistake that many new traders make. 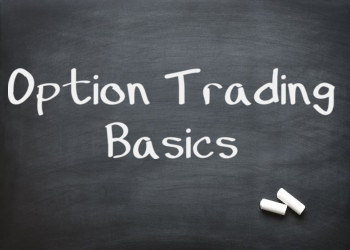 What I've found with new stock and option traders is that they rarely get the best price on a trade. By forcing yourself to pick the best price, it keeps you out of bad trades and allows you to tune out the noise. Will you miss out on a few winning trades? Sure it's possible. But you'll also be avoiding those costly reactive trades that deplete both your financial and psychological capital. The other benefit of picking your price is that it allows you to take a step back and be a much better observer of the market. Your opinions and biases are completely different when you're involved in a position compared to when you are "stalking" for the best price. If you get good enough, you can develop a feel for a stock on where the pain points are and where the stop runs will be. Those are usually the best entry points for a stock. Chevron (CVX) just had a failed breakout. It cleared key resistance at 104 for a week or so, but the continued weakness in the oil space helped to bring the stock back into the range. When we have a failed breakout, the stock tends to trade to the other side of the range, which is at 97.50. That's a price I'd be willing to get long. This step works best when you are looking at reverting kinds of setups where you let the price come to you. If you are trading breakouts or trend continuation plays then you'll need to be more active, setting alerts and being ready to enter on your breakout signals. 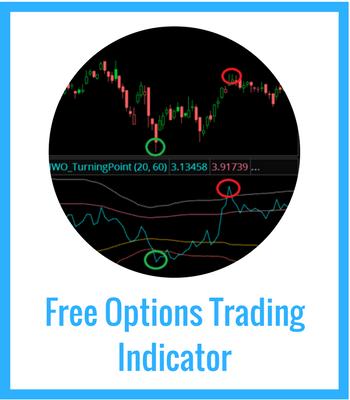 Yet if you're looking for a way to automate your options trading, this is as close as you can get. Simply put, you need to pick your option strategy and then figure out what price that strategy will hit if the stock price comes into what you want. Remember, options are derivatives. The pricing is derived from movement in the underlying and the implied volatility. Let's head back to our example in CVX. Say I wanted to use bull put spreads as a position. So I'd go out and look at the September 90/85 bull put spread. So the current price is 0.33. That's not the kind of risk/reward I am looking for. 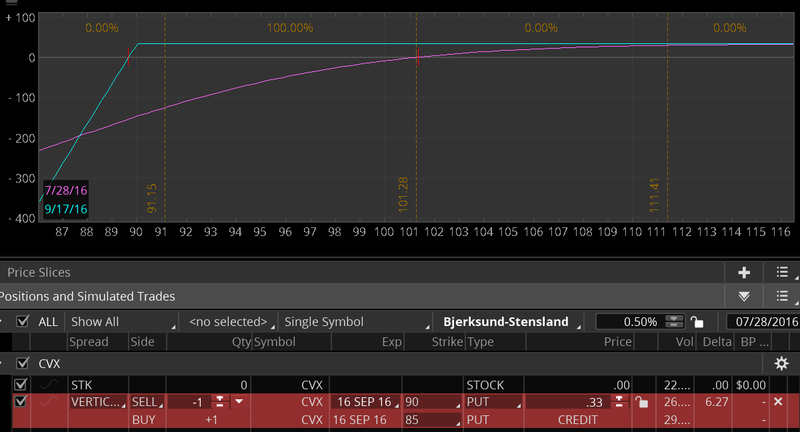 However, if CVX trades into my target price of 97.50, then the spread will be worth between 0.65 and 0.70. That's a better entry point. Here's the cool thing... you can set GTC (Good till cancel) orders on this spread. That way you don't have to worry about being at your trading screen at the right time. You've already planned your price, and planned your option strategy. What else can you do? I'll be straight up with you, even if you have your perfect prices, the natural volatility of the market will try to shake you out of your position. Why not use that in your favor? When I work with newer traders, they view each trade as an "all or nothing" kind of strategy. Get into the trade all at once, and if it doesn't work then you stop out. Doing that leaves you with tighter stops on a trade, giving you higher odds you'll get shaken out of a trade. If you can learn to use the natural volatility of the market, you can get better fills and more profits with the same amount of risk. Let's go back to our example in CVX. My initial price would be 0.65, but I would start with smaller size and then add to the trade at 0.95 and then at 1.50. That way if CVX really stretches to the downside I'll be prepared to take the heat and increase my odds in the trade. Want To Get This Done For You? We just launched a new service called Proactive Spreads. With this service, you'll get the best stocks, at the best prices, with the best option spread to trade. It only takes 15 minutes to setup the trades in your brokerage account. See how you can become a more consistent trader with Proactive Spreads.